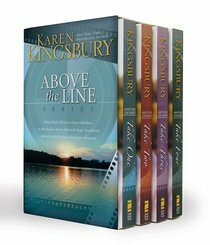 For the first time ever, the four complete novels in the Above the Line Series, by New York Times bestselling author Karen Kingsbury, are now available in one special edition boxed set. This exclusive, limited release is a can't-miss Christmas gift for you and for the millions of Kingsbury's fans around the country. - Publisher The four complete novels in the bestselling Above the Line Series follow dedicated Hollywood producers, as they seek to transform the culture through the power of film. The series also features characters from the Baxter Family. Take One With millions of investors' dollars on the line, Chase Ryan and Keith Ellison realize they may be in over their heads in the struggle to fulfill their dreams to change lives through the power of film. Take Two Independent filmmakers, Chase and Keith discover that all that glitters is not gold, and that success in Tinsel Town could cost them everything---their relationships as well as their ideals. Take Three Keith Ellison's dream of making films that change lives is coming true. But at what price? His daughter, Andi, is growing up fast and her choices could tear the Ellison family apart. Take Four Keith Ellison and his new partner in filmmaking, Dayne Matthews, ink a deal with the nation's top young actor to star in their biggest production yet. But the actor's reputation for partying threatens the mission of the company. The producers become missionaries in order save the film, their families, and the young movie star. About "Above the Line Series Boxed Set (Above The Line Series)"
The four complete novels in the bestselling Above the Line Series follow dedicated Hollywood producers, as they seek to transform the culture through the power of film. The series also features characters from the Baxter Family. Take One With millions of investors' dollars on the line, Chase Ryan and Keith Ellison realize they may be in over their heads in the struggle to fulfill their dreams to change lives through the power of film. Take Two Independent filmmakers, Chase and Keith discover that all that glitters is not gold, and that success in Tinsel Town could cost them everything---their relationships as well as their ideals. Take Three Keith Ellison's dream of making films that change lives is coming true. But at what price? His daughter, Andi, is growing up fast and her choices could tear the Ellison family apart. Take Four Keith Ellison and his new partner in filmmaking, Dayne Matthews, ink a deal with the nation's top young actor to star in their biggest production yet. But the actor's reputation for partying threatens the mission of the company. The producers become missionaries in order save the film, their families, and the young movie star.